With many traders considering the market as a money-producing machine and looking for quick returns, the probability of sizable losses is higher than ever. 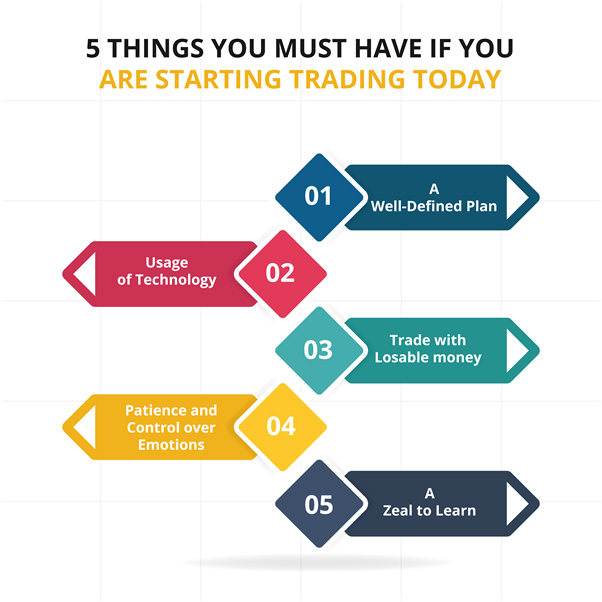 Considering this fact, if someone is critical of investing in the stock market, these are the five things one must have before starting. Stock trading is one of the most prominent ways to earn some extra returns on investment. In today's time, most people are trading stocks online and technology has made it easier for them to do so. Several online trading platforms facilitate trading while sitting in the comfort of your home. Apart from this, there are various trading apps and stock apps which are also convenient to use. However, with growth in the number of investments, the number of people losing their hard-earned money in the stock markets has risen too. A well-defined plan: A successful trader always has a plan. The most important thing to have before you start trading is a proper strategy. One should always have a set discipline to enter and exit the market. This will help them gain confidence while trading. For this, traders should research on technical and fundamental analyses; they can learn more about this from the knowledge database of trading websites. Use of technology: Trade market is a competitive place, and you should assume that the person sitting on the other side of a trade is fully aware of good utilization of technology. Using technology to one’s advantage is the key to success. With the evolution of smartphones, several trading apps are available to help monitor the stock market in real time. Trade only with losable money: The most common mistake most traders do is that they invest more than they ought to. The trade market is highly volatile. Hence, it is always a smart move to protect your money through proper money management. The priority is to make more rather than lose more. One should always allocate a certain amount of money from their total income to trading, and that should be it. Trading with money allocated for daily expenditures should always be avoided. Patience and controlling emotions: Trading is also about managing fear and greed. There will be times when one will make mistakes and lose money, which can subsequently make him/her impatient and doubtful about their strategies. Here, patience is the key to success. No matter what, one should always stick to their plans and strategies. Another important thing which one should always keep in mind is to never involve emotions with trading. It doesn't matter whether you make money or lose it, there is absolutely no place for emotions in the world of stock trading. A successful trader always keeps his/her emotions in check. Zeal to learn: With the markets being ever-dynamic, nothing stays the same over a period, including the strategies with which one had started. Hence, it is imperative to learn and evolve continuously. One needs to stay updated on latest news, market trends, psychology, and technical aspects. Learning daily and improving the next day is the best path to a successful trading career.